The Roman Catholic Waterton family, of Wakefield in Yorkshire, became involved in Demerara when Anne Waterton met and married (c1773) Michael Daly (d c1786), a prominent Irish planter there. Her brother Christopher came to the colony and married (c1790) Anne Waddell, the widow of another Irish planter, Edward Bermingham. Christopher thus acquired a half share in plantations La Jalousie and Fellowship on the west sea-coast. Thomas Waterton, the older brother of Christopher and Anne, then bought a plantation, which he named Walton Hall, after the family home near Wakefield. 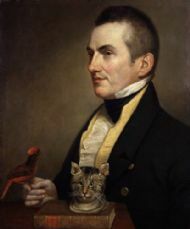 Thomas’s son Charles Waterton (1782-1865) went out to Demerara in 1804 to manage the family’s estates. Charles became a pioneering, if eccentric, naturalist. Although he returned to live at Walton Hall in Yorkshire, he made further expeditions to the forests of Guyana, publishing an account in his Wanderings in South America, the North-west of the United States, and the Antilles in the years 1812, 1816, 1820, and 1824. At Walton Hall be created one of the world's first nature reserves by enclosing his estate with a high wall and encouraging wild life. In 1829 he married Anne Edmonstone, the 17-year old daughter of the Scots planter Charles Edmonstone, who had been his friend in Guyana, and his half-Arawak wife, Helen Reid. Anne died the following year after giving birth to a son. Waterton's system of preserving birds and mammals consisted not of stuffing the specimen but carefully removing the skin and slowly hardening it with mercuric chloride (a compound used by hatters). Waterton believed this process allowed him to give the specimen a more natural pose. He trained a number of Edmonstone's slaves in taxidermy, including John Edmonstone, who later gave lessons to Charles Darwin. In his will of 1797 Christopher Waterton made provision for the 'negress Diana' and her two 'mulatto children' Sally and Samuel - and also confirmed that they had been freed [The National Archives; Kew, England; Prerogative Court of Canterbury and Related Probate Jurisdictions: Will Registers; Class: PROB 11; Piece: 1506]. Samuel Waterton received compensation for eight slaves at emancipation in 1834 [British Guiana claim 2202]. Sally may have been the 'Miss Waterton' who, along with Miss Chapman advertised the opening of their 'Seminary for Young Ladies' in 1815 [E&DG 18 Mar 1815]. Waterton's natural history and ethnographical collection is in Wakefield Museum.